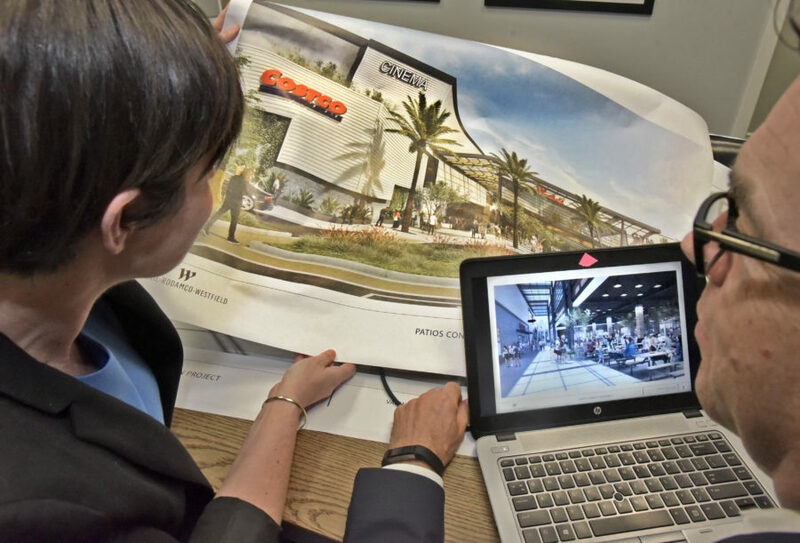 Westfield Valencia Town Center officials announced a $100-million investment Wednesday to add features, including a new Costco, luxury cinema and fitness center, dramatically transforming the site of one of the mall’s original anchor stores. The Patios Connection project is a redevelopment of the eastern portion of the property where the former Sears location, which closed a year ago, will transform into a larger building and center for these new amenities that aim to build on the mall’s vision of creating a one-stop destination for consumers. Mall officials Wednesday shared with The Signal renderings that depict the project’s core design, aimed at improving the center’s overall flow and connectivity. The anchor of the project is the Santa Clarita Valley’s second Costco retail and gas station, which will be located on the lower level of the proposed new building, according to Chris Kitchen, vice president of development for Unibail-Rodamco-Westfield. This locale will be uniquely designed to seamlessly blend with the rest of the Valencia Town Center, officials said. Kitchen said the idea to bring in a new Costco had been in the works long before Sears closed, with multiple properties as options, but the mall location flowed with a trend that’s evident across multiple Westfield locations, including The Village at Topanga, which also connects mall shoppers to a Costco. To address a potential increase in traffic congestion that can come with the new development, Kitchen said officials have been working closely to evaluate reports with traffic engineers and the city of Santa Clarita. A 320-space parking lot to mitigate parking congestion is also in the project plans. The second floor of the Sears replacement building will house the cinema and the full-service health and fitness center to easily stream into the shops and retail at The Patios level. Cinema and gym tenants are still in the works, said Kitchen, but patrons can expect an upscale setting. Much planning is still underway for the project, but officials estimate The Patios Connection development to be completed by mid- to late-2020.